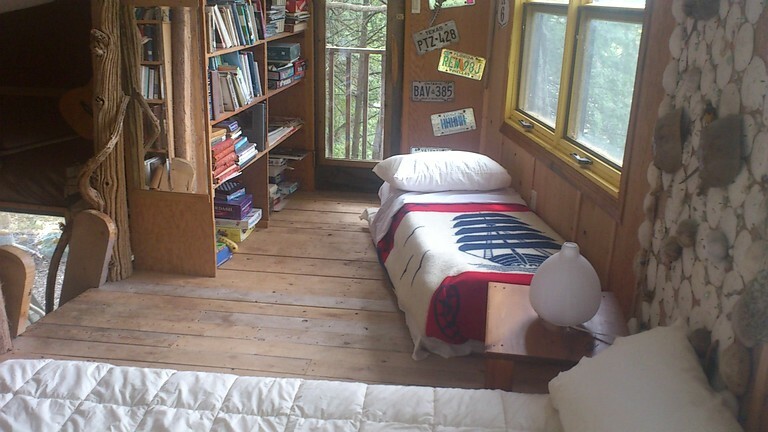 Sleeping up to eight people comfortably this eco-friendly tree house, which is built over the Mississippi River in Lanaark County, Ontario, Canada, is indeed suitable for a family with kids, a group of friends and pet lovers. 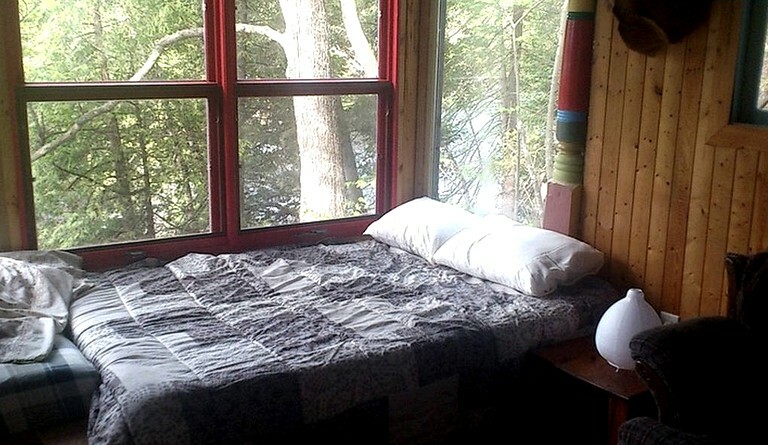 On the main floor of the tree house, there are two beds: a single bed and a double bed. 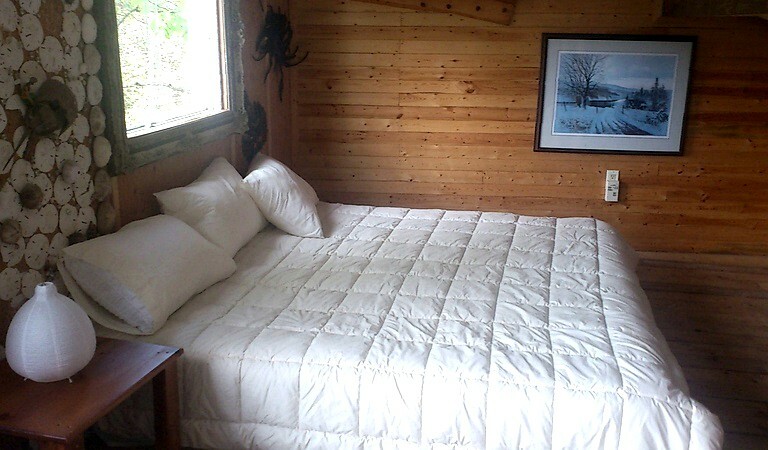 For extra sleeping arrangements for guests and their pets, there is also a pull-out couch. 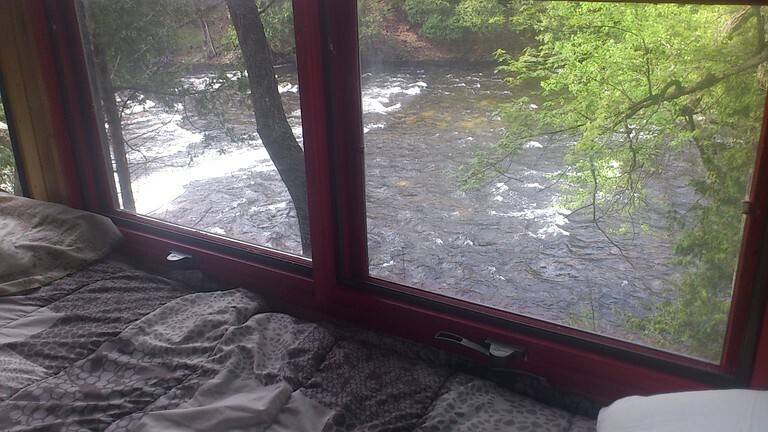 There is a spectacular view in this are in which the beds are put into. The upstairs in the loft room, there is a large king-sized bed ready to be slept in. Linens and towels are provided by the host. 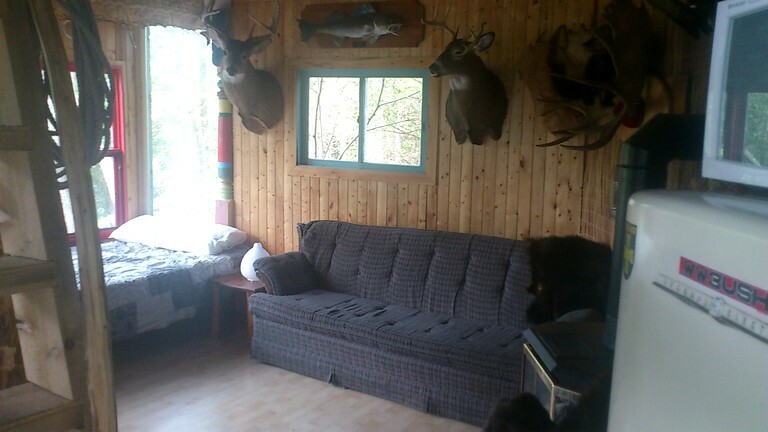 The decor of the tree house is entirely with wild game mounts, fish, and stuffed fowl, as well as a 16-foot anaconda skin for a more naturalistic style. 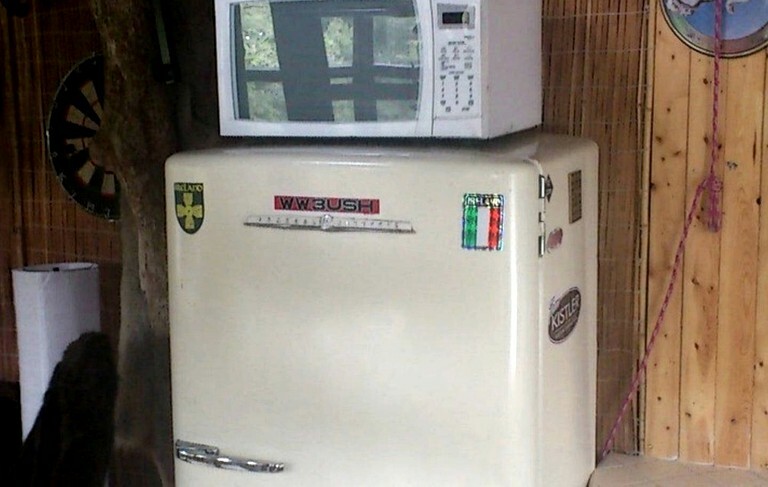 The kitchen is equipped with a small oven, a microwave, a hotplate, and a coffee for guests to use. As an addition there is a propane barbecue outside for guests to make a delicious BBQ dinner. The hosts have graciously provided pots and pans, all plates, glasses, cutlery, and more. For extra taste there are a few spices, salt, pepper, and sugar available. Please keep everything tidy before departing the accommodation. The kitchen as running cold and hot water that is more than safe for guests and their pets to drink. The bathroom includes a sink and composting toilet. 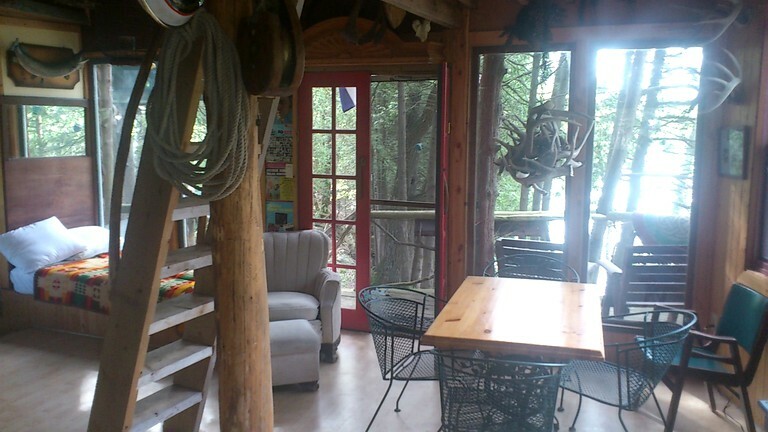 Other amenities are a gas fireplace inside the accommodation and a fire pit outside of the tree house. 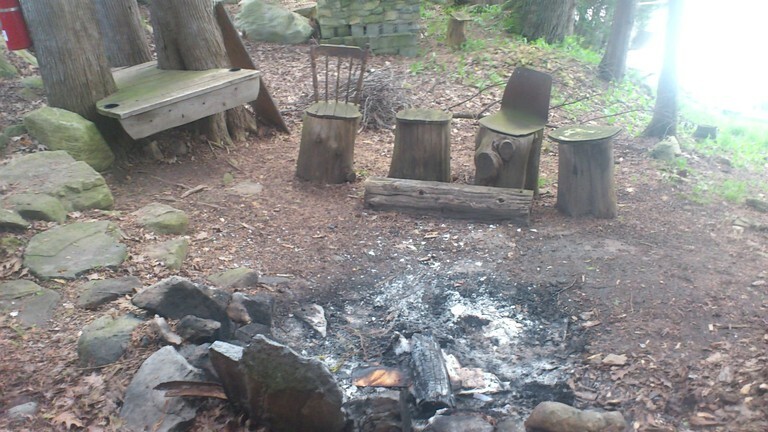 Firewood is not provided for the fire pit. On site, glampers will find a fridge, a stove, a barbecue, a sink, a composting toilet, and a hot water outdoor shower. The outdoor shower runs off of the hot water tank under the kitchen sink. If guests use up all of the hot water, it takes about 20 minutes to heat the tank up again. Please note—sometimes the water smells a little sulfurous, but it is not harmful in any way. There is a comfy lounge on the property, and there are loads of board games, books, and DVDs. There are fishing rods at guests' disposal, but glampers will need to provide their own tackle and bait. Since the tree house is on the water, most of the activities are aquatic, such as rafting, canoeing, swimming, fishing, and kayaking, etc. The region also offers great trekking trails to explore by bike or foot. There is lots of room for lounging in and around the rapids and it is easy to sit right in the rapids. There are many swings, hammocks and seats all over the site so you can pick your favorite spot to lounge and watch the world pass by. Pets are welcome; however they should be kept down in the tree house area. Many of the neighbors have pets, so please keep watch of them at all times and be conscious of the other animals that may be around in the area. There is absolutely no smoking allowed in the tree house. The hosts have provided ashtrays in various areas around the accommodation, and if guests are down by the fire pit, please throw the butts into it. The hosts ask that guests please leave the tree house in the same condition they found it in, with the exception of the beds. On the day guests leave, please do not make any of the beds that were slept in.